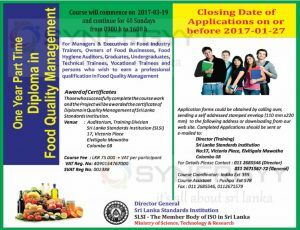 Sri Lanka Institute of Standards invites applications for the Diploma in Food Quality Management for January 2017 intakes. This course will commence on 2017-03-19 and continue for 40 Sundays from 0900 h to 1600 hours and application closing date will be 2017-01-27. This programme suitable to Managers & Executives in Food Industry Trainers, Owners of Food Businesses, Food Hygiene Auditors, Graduates, Undergraduates Technical Trainees, Vocational Trainees and persons who wish to earn a professional qualification in Food Quality Management. Those who successfully complete the course work and the Project will be awarded the certificate of Diploma in Quality Management of Sri Lanka Standards Institution. Venue: Auditorium, Training Division, Sri Lanka Standards Institution (SLSI) #17, Victoria Place Elvitigala Mawatha Colombo 08.